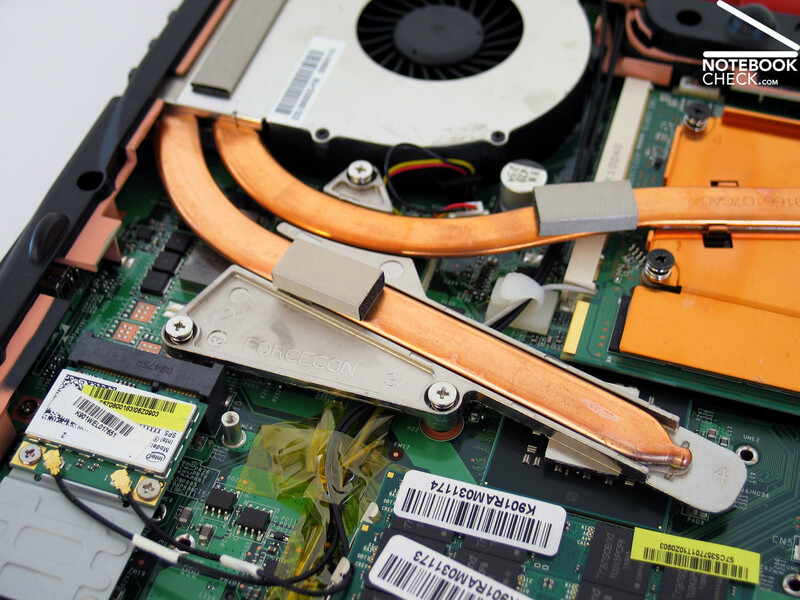 When looking for a compact gaming notebook, given the often restricted graphics card performance in the 15" market, there is a big risk of just giving up. The fact that the Geforce 9600M GT so commonly provided can be outdone, even in this mid range of machines, is proved by MSI with its GT627. Equipped with a Geforce 9800M GS graphics card, this compact laptop can handle even the most recent gaming titles with ease. MSI actually already has a number of (primarily gamer focused) notebooks in its catalogue. Noteworthy among this collection would be the GX620 and the GX720, each fitted with an Intel CPU and a Geforce 9600M GT from Nvidia in 15.4" and 17.0" format respectively. 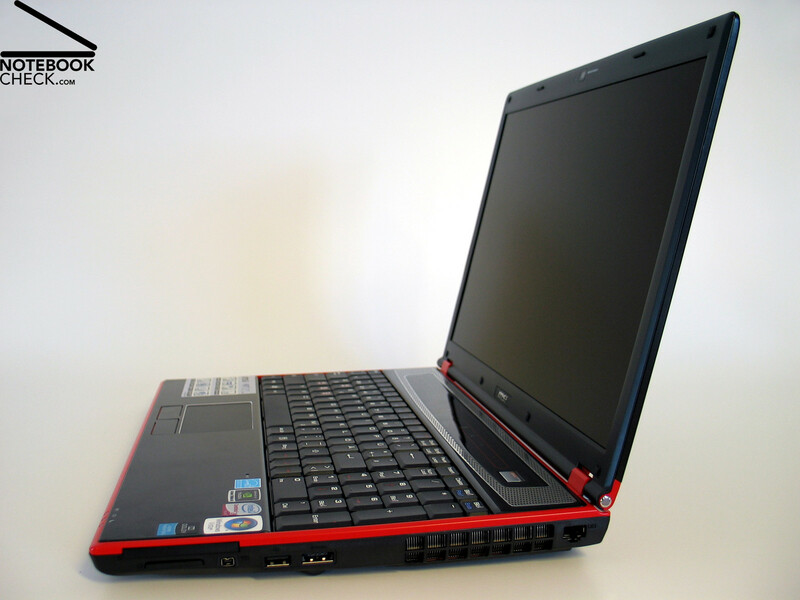 The GX630 corresponds to the GX620 model however is equipped with an AMD Turion CPU. In terms of performance, the GT models are a leap ahead, for example the GT735 with its Turion X2 Ultra CPU and ATI Mobility HD3850 graphics chip or the GT627 model at hand with its Geforce 9800M GS graphics solution and Intel CPU. 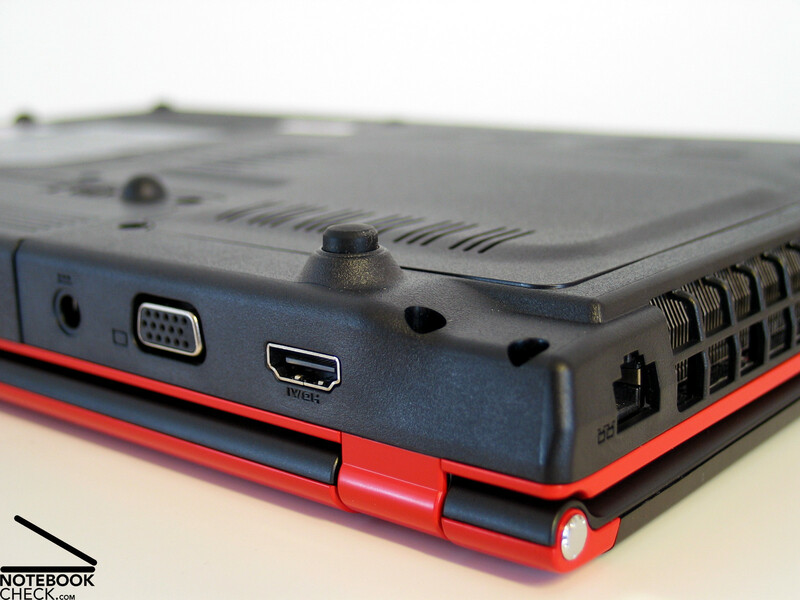 Gaming notebooks are often constructed to look like exactly that. This is presumably in order to differentiate themselves from the notebook masses while advertising their (hopefully) superior performance. There's nothing wrong with that, but it does need to be realised that gamers don't necessarily suffer from confused aesthetic taste, and hence would be justified in demanding a tasteful exterior for their machine. Luckily MSI always seems to solve this kind of issue quite well. This can be seen on the GT627 with its red case-features that clearly display the notebook's gaming orientation while remaining "proper-enough" looking not to seem out of place among the usual multimedia notebook ranks. On the other hand, the metal trimmings on the display lid as well as in the palm-rest areas make the case seem quite ornate and also improve the notebook's tactility. The machine was however not entirely convincing in terms of case stability and workmanship. The base unit was not very rigid and at times deformed quite significantly under pressure. This was particularly the case in the central area of the additional function keys. Lifting the device by its front edge led to light squeaking and creaking noises accompanied by visible warping of its exterior. The display itself was, mainly thanks to its large metal trimmings, quite resistant to any pressure applied. The display's tortional strength and rigidity were also quite pleasing. Both display hinges seemed visibly fairly flimsy and in practice had difficulty holding the display in position without see-sawing. A locking mechanism for the screen in its closed position has been done without entirely. 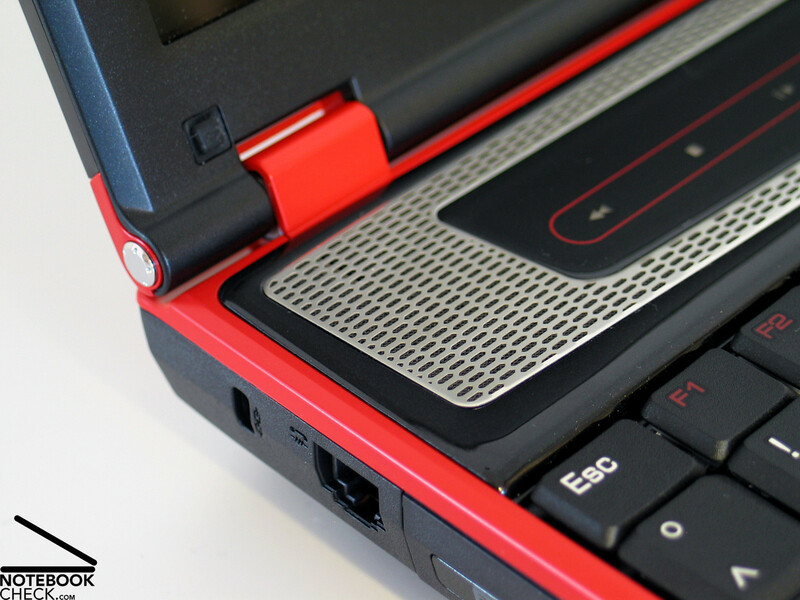 With the exception of the front edge, the GT627 is dotted with ports around its entire case. 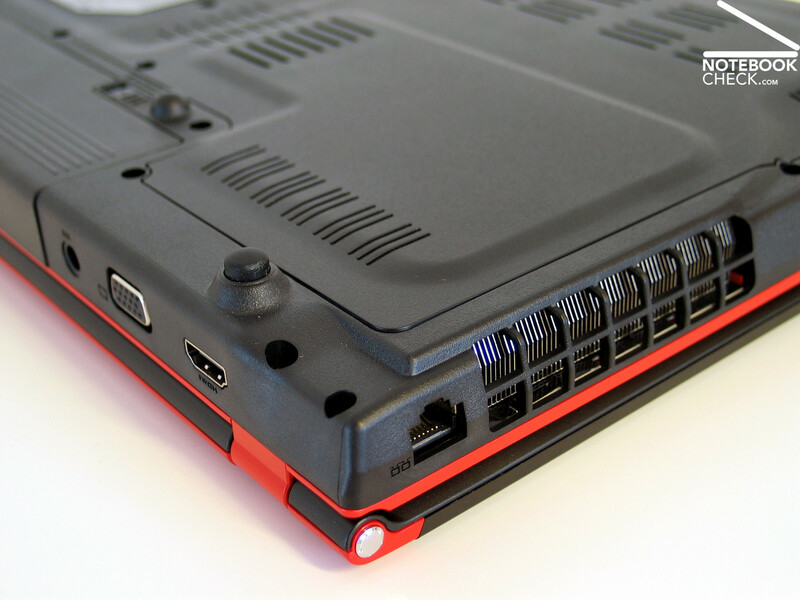 Highlights include a combined USB/eSATA port as well as a digital HDMI port at the back. The four 3.5mm audio ports are great too including jacks for headphones, microphone, line-in and line-out. We were somewhat critical of the positioning of the individual ports however. All of the USB ports (including the USB/eSATA connector) are on the sides of the machine placed right towards the front. This means the simple connection of an external mouse can easily cause a tangle of wires beside the machine. The ventilation hole on the right-hand edge of the notebook in our opinion isn't that well placed either. Right-handers using an external mouse for example are subjected to a constant stream of warm air which can get quite uncomfortable after a while. With a Gigabit Ethernet connection (Realtek RTL8168B) and Wireless LAN of standards b/g/n leave nothing to be desired in that regard. Bluetooth 2.0+EDR is also optinally available (depending on model). What isn't offered however is integrated wireless broadband (UMTS/HSDPA). The inbuilt 56K modem from Motorola could almost be described as ancient. 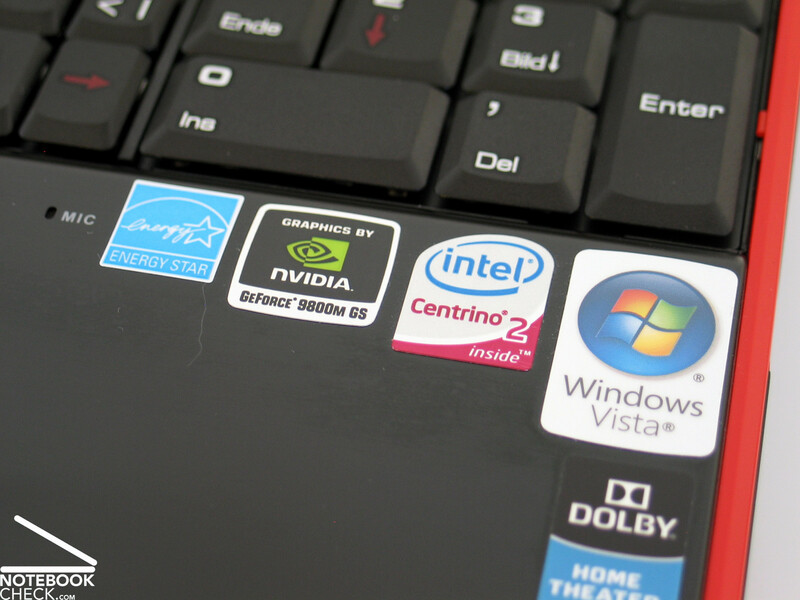 The MSI Megabook GT627 comes factory installed with the 32-bit version of Windows Vista Home Premium. This seems a bit strange considering 32-bit operating systems can only utilise a bit over 3GB of RAM and the notebook is fitted with 4GB. 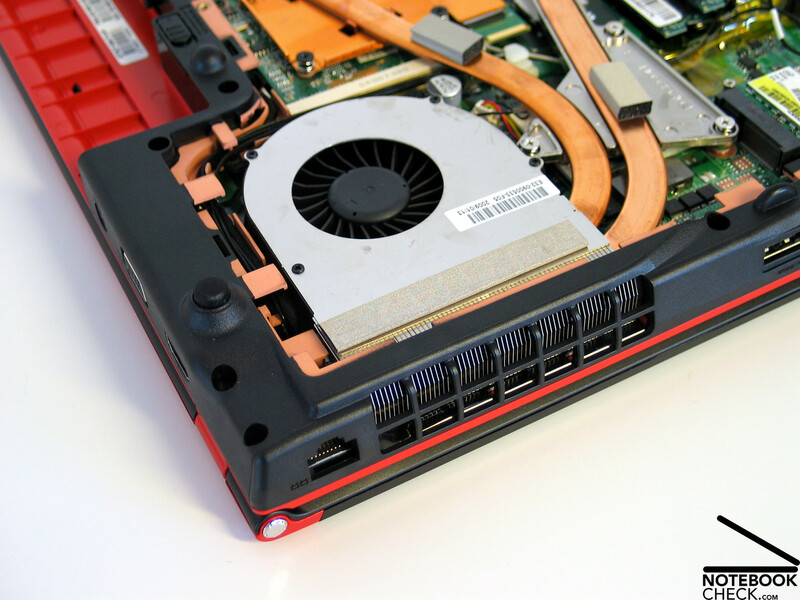 In terms of warranty, MSI offers a standard 24 month pick-up & return service. 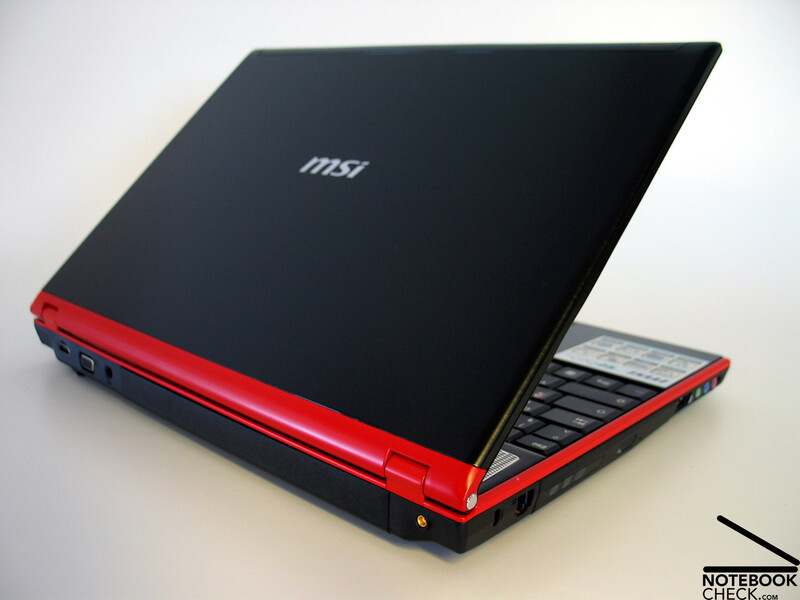 The MSI GT627 is one of the few notebooks in 15.4 inch format to offer a separate number pad. The question of having a separate number pad or not is really quite a difficult one, benefiting from a more spacious layout and larger keys when without, while greatly aiding the input of numeric material when present. To what degree this is actually useful on a gaming notebook is however more doubtful. 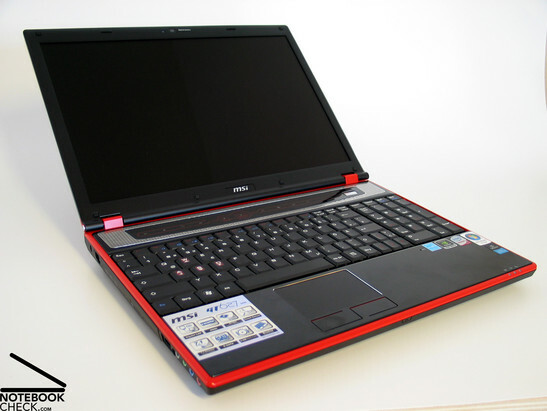 Be that as it may, through the red imprinting on both the arrows keys and the number pad as well as on the usual, although in the case of the MSI 627, heavily, miniaturised arrow keys as well as in the area of the AWSD keys, MSI has attempted to highlight the notebook's intended gaming use. 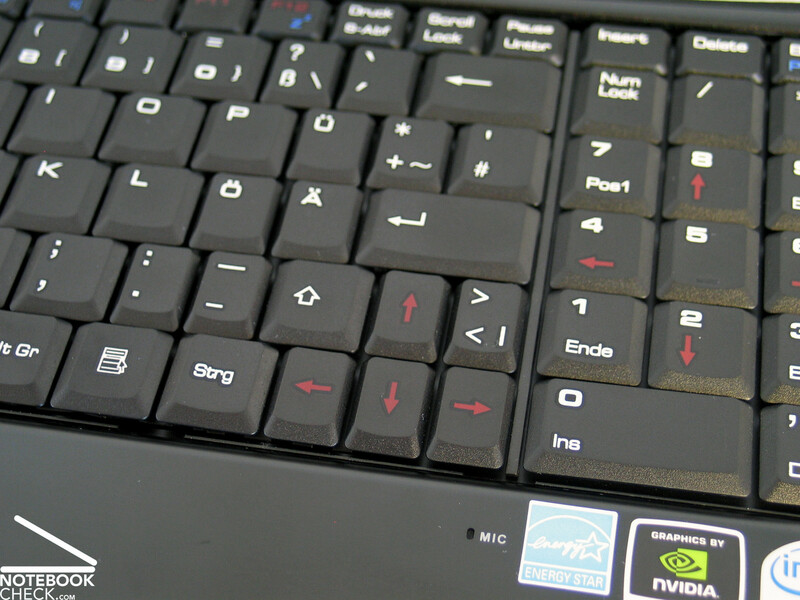 Speaking of gaming use... the positioning of the FN key in Thinkpad style at the very bottom left corner of the keyboard was somewhat questionable, although when used in combination with Ctrl - ^ will bring up the console in many games [when using a German keyboard layout]. This means the MSI GT627 keyboard may take some time to get used to. The typing feel can be described as rather soft yet requiring deep key presses. Since the keyboard unit tends to give way marginally in certain areas, pressing hard on the keys makes them seem to spring a bit more than usual. This takes some getting used to when typing documents however for gaming use its role should generally be much less significant. 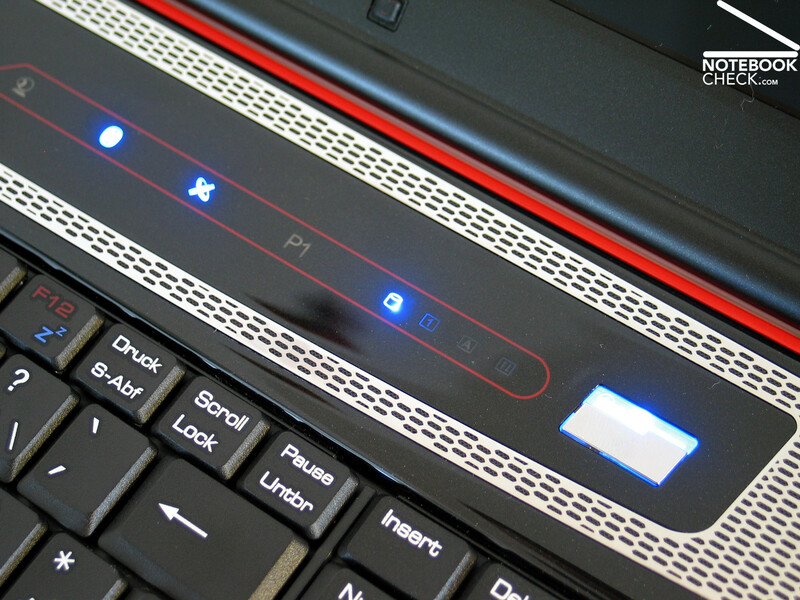 The special function keys have also been made visually appealing in their touch-sensitive type zones with corresponding illumination above the keyboard. The less appealing feature of this is its shiny surface which very quickly collects unattractive fingerprints. The touchpad provides an extermely comfortable and appropriately slippery surface with one scroll zone on the right hand side which is however not marked visually. We had nothing bad to say about the pad's touch response either. On the other hand, of the two provided, the touchpad's right click button could unfortunately only be depressed with a relatively heavy click. This lead to some serious tiring of the thumbs with repeated use and hence we found it most comfortable to press the button using both hands. With the GT627, MSI provides a high resolution WSXGA panel of 1680x1050 pixels which gives it a serious advantage in terms of screen real estate. The increased potential resolution is also a plus for the visuals in many games. In our tests, the display reached a maximum brightness of 188.1 cd/m². What was slightly disappointing however was the dropoff in brightness towards the top edge of the display of up to 135.8 cd/m². The resulting illumination level of the display at just 72.9% was therefore hardly surprising. Not just a technical reading, even subjectively it's easy to notice how much the top edge of the display is visibly dimmer. What was acceptable however was the panel's maximum possible contrast measurement. In the centre of the display this reading was as high as 418:1. Another positive note is that the brightness can be set at its maximum level even in battery mode. 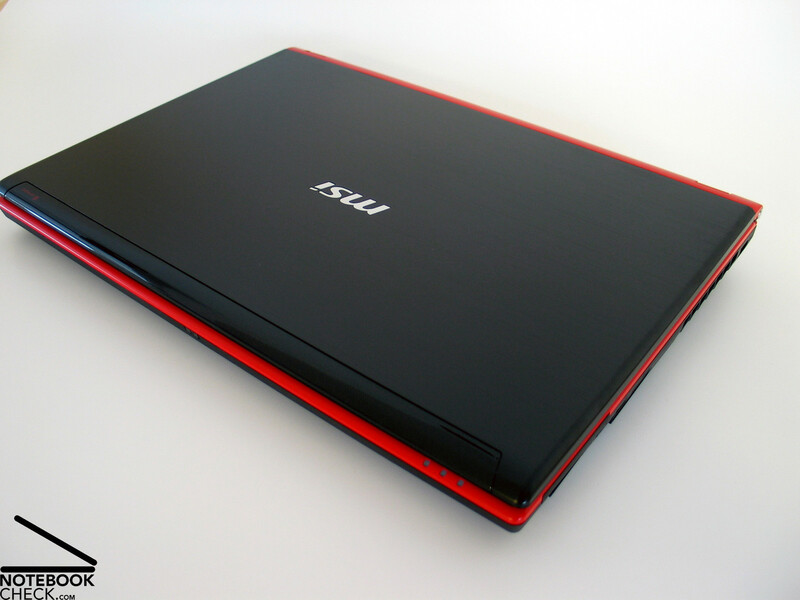 It would be hard to recommend use of the MSI GT627 outdoors under environmental light conditions. On one hand the display's glare-type surface produces distracting reflections and on the other hand its maximum brightness is, as noted, fairly average. And things didn't look much better for the display's perspective stability either. Even minor deviations from a perpendicular viewing angle vertically caused visible picture alterations. Variations in horizontal angle more than anything caused issues with undesired reflections appearing. 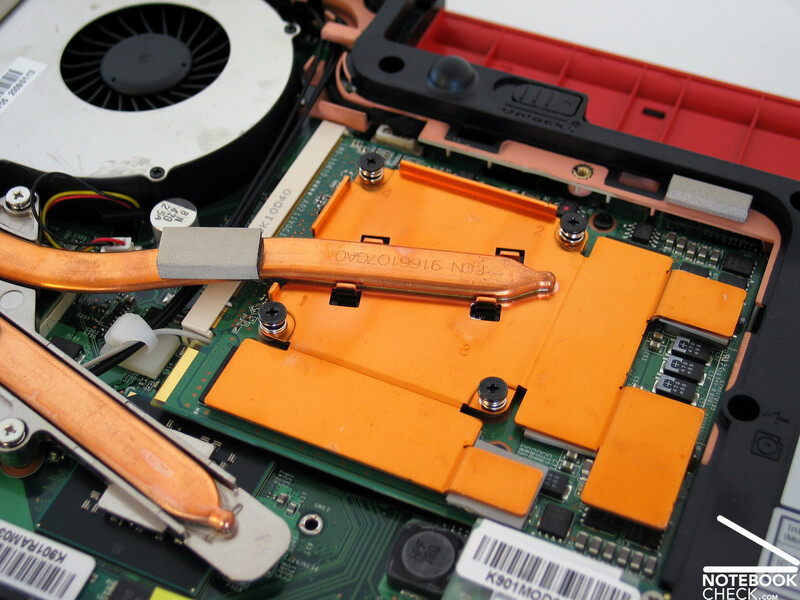 For a notebook specifically designed for games, one extremely important component is its graphics card. In this machine MSI has included the Geforce 9800M GS, a graphics card from the top performance class in our comparison of mobile graphics solutions that is usually only included in larger 17" models. 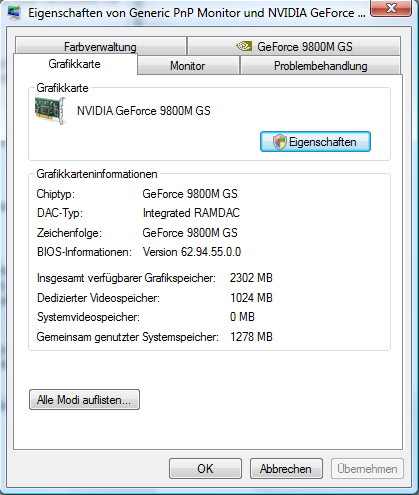 Technically the Geforce 9800M GS corresponds to the 9600M GT desktop core with a higher clock speed. 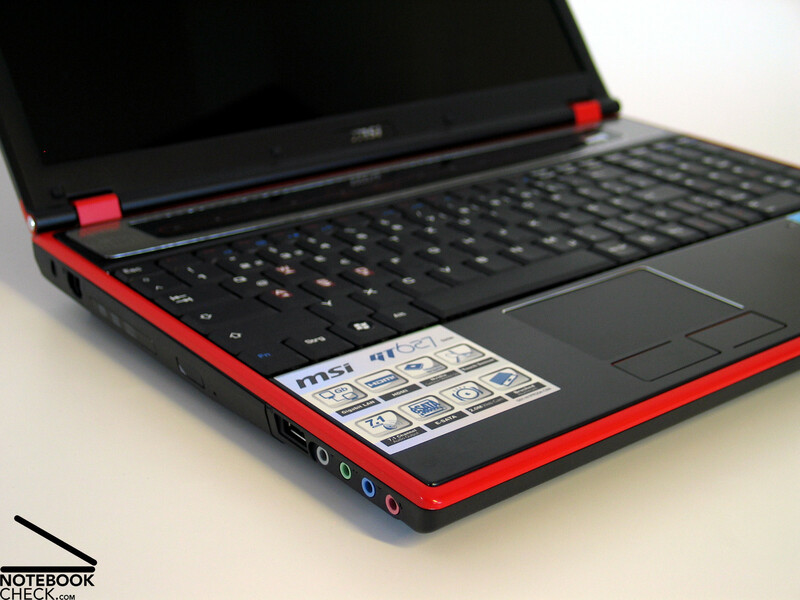 With its Intel P8600 CPU, MSI hasn't really chosen a gaming-level CPU for its Megabook GT627. 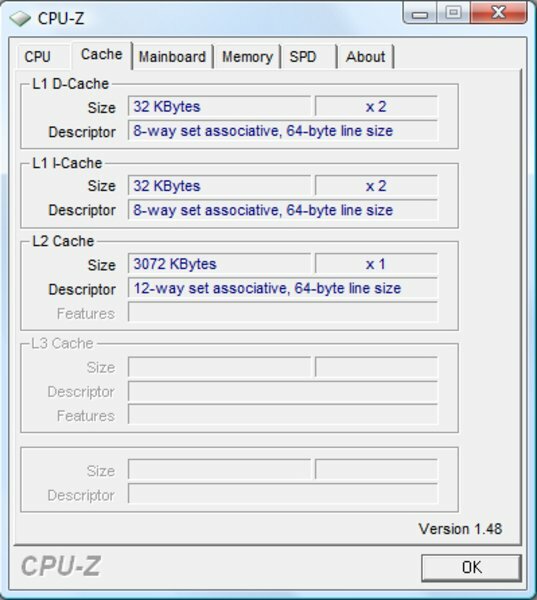 The chip's key features are as follows: 2.4 GHz, 3MB L2-Cache, 1066 MHz frontside bus, 25W TDP. This Penryn dual-core chip from Intel is manufactured in a 45 nm process corresponding to the current standard. The main feature of the Pxxxx models is above all their low power consumption and heat dissipation. For this reason these chips can be used in extremely compact devices where sufficient cooling could otherwise be an issue. 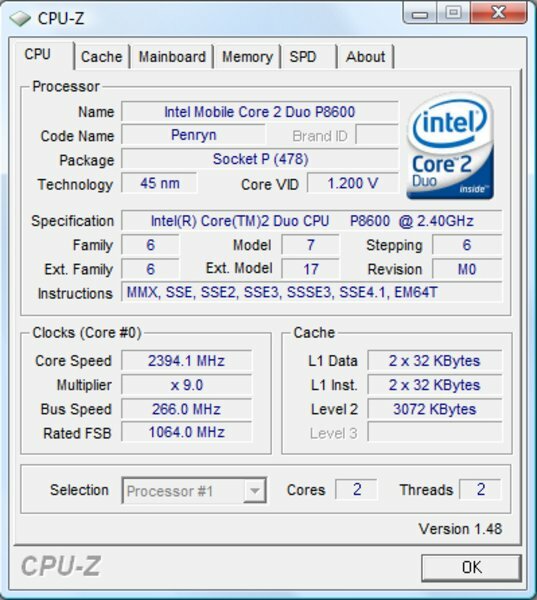 This is most probably the reason why MSI is holding onto the Intel P-variants, and why they are not currently offering any other CPU options for the GT627. To date, as shown in our extensive Quad-Core comparison, it's still the MHz that count in the current games, rather than the number of cores - only with GTA IV do the quad-cores gain a large performance advantage. MSI uses this fact to its favour, integrating an easy-access overclocking function into the GT627. 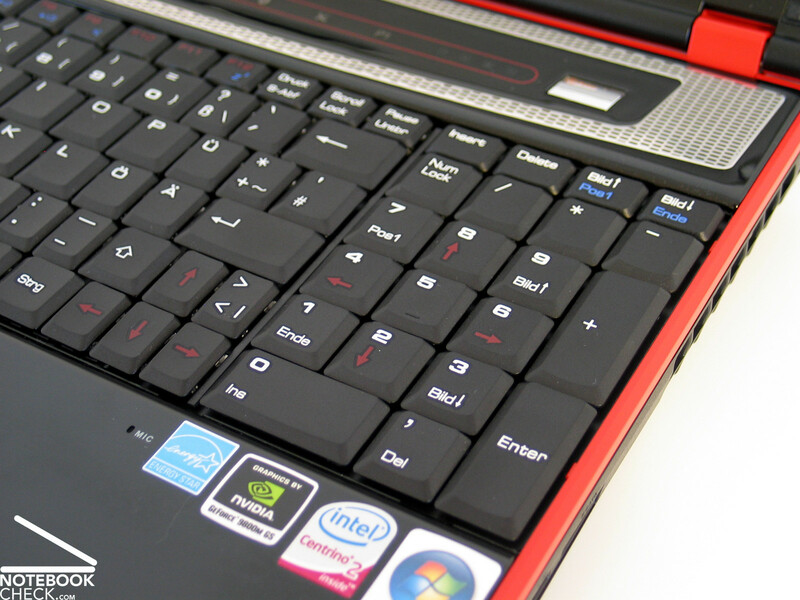 The Turbo Button above the keyboard raises the CPU clock to 2.77 GHz; an increase of about 15%. Since the higher clock speed hugely increases not only the chip's energy usage but also its heat output, activating Turbo mode under load very soon leads to an increase in fan speed. The Turbo function enables a power saving mode when not under load along with the related benefits of reduced emissions while at the same time providing a considerable performance boost on demand when needed. The price of the CPU also remains quite low when compared to more powerful CPUs. 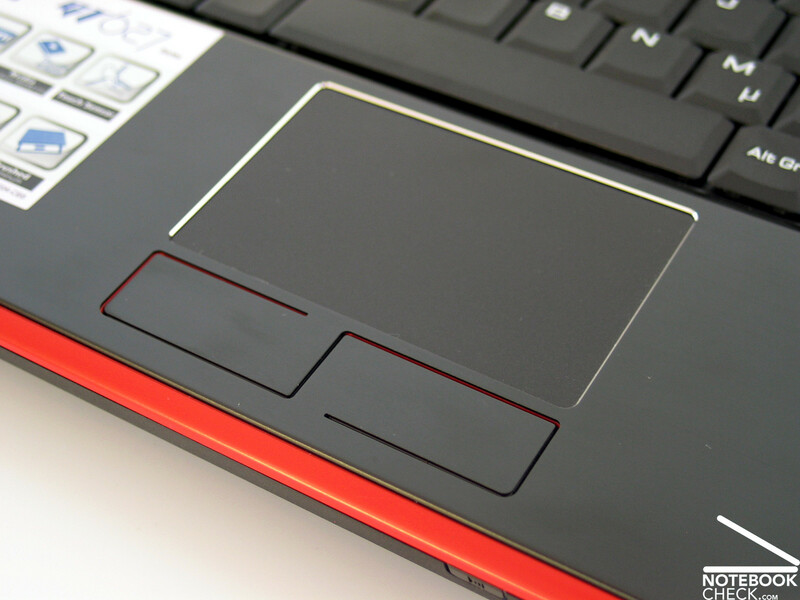 Quite an interesting and promising solution for a compact gaming notebook! How effect is the Turbo function for various uses though? 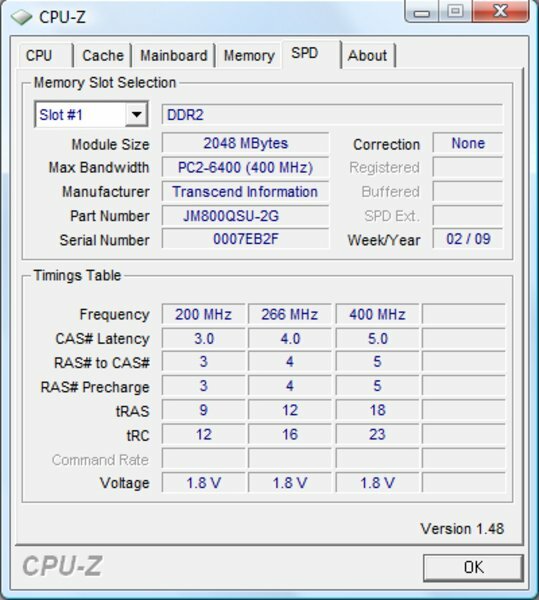 In the 3D Mark 2006 benchmark test, the MSI GT627 at regular clock speed achieved a good 8313 points and 2175 in the CPU score. With Turbo mode activated the result improved a meagre 3% to 8586 points. The CPU score however increased by almost 16% to 2521 points. There was a similar story for the PC Mark 2006 benchmark test. Here the already good result of 6481 points increased with the help of the Turbo function to an extremely good 7384 points. That's an improvement of 14%. The influence of the Turbo mode on the Cinebench R10 benchmark was also extremely interesting. In single core rendering it provided a performance boost of 17% and in multi core rendering an advantage of 16%. The results on the OpenGL shading test, were as surprising as they were impressive. Reaching 4636 points, the MSI GT627 gained an entire 25% of performance in Turbo mode. 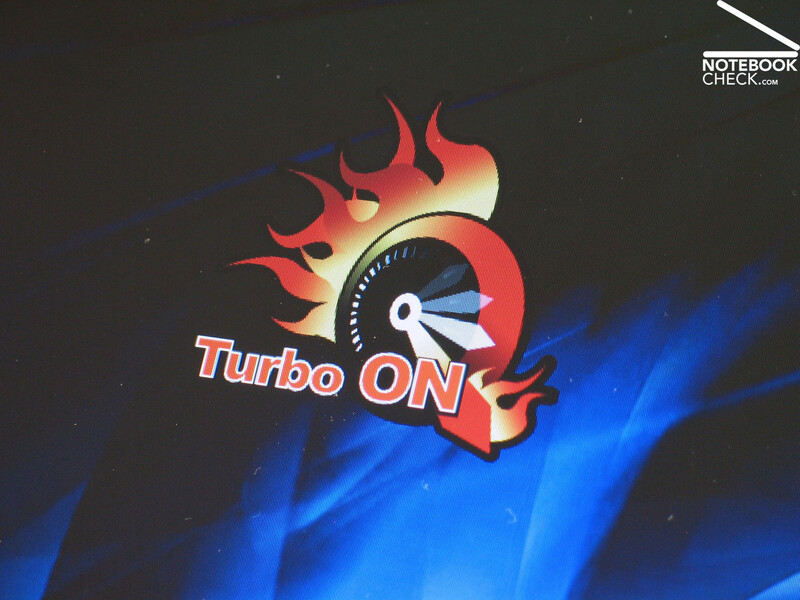 Given the above benchmarks, it is obvious that the Turbo function can be a huge positive for CPU-intensive operations. Most applications involving complex calculations can benefit, such as image rendering or encoding/decoding tasks, making for considerably shorter calculation times. The effect this increased CPU performance has on current games will be seen in the next section: gaming performance. 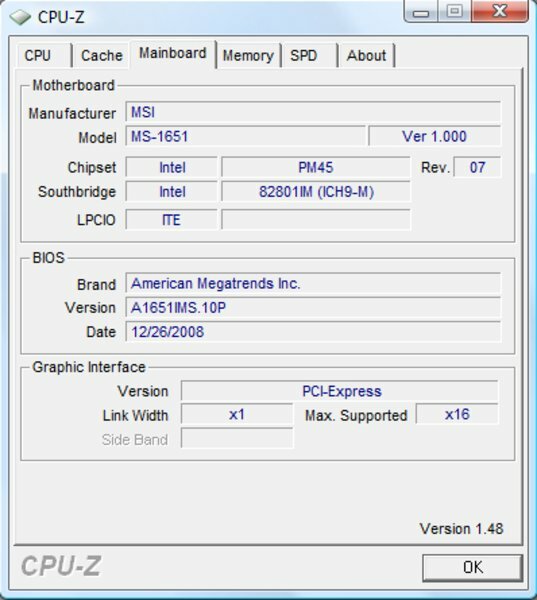 Before that however, the MSI Megabook GT627's system RAM. While the notebook provides a total of 4096MB of RAM, it comes with a 32-bit operating system pre-installed, meaning only about 3GB of the included RAM can actually be used. 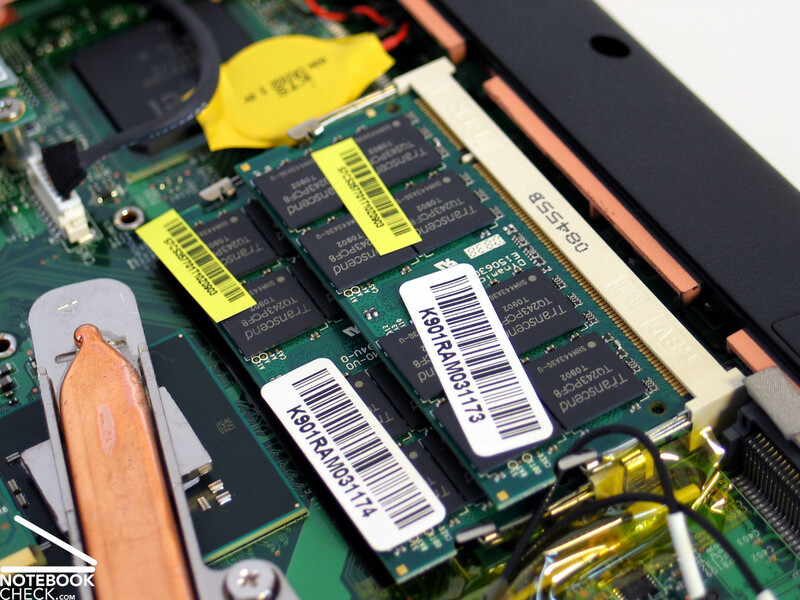 The RAM is provided in the form of PC2-6400 DDR2 chips. MSI offers either 250/320 or 500GB hard disk setups using 5400 rpm drives. 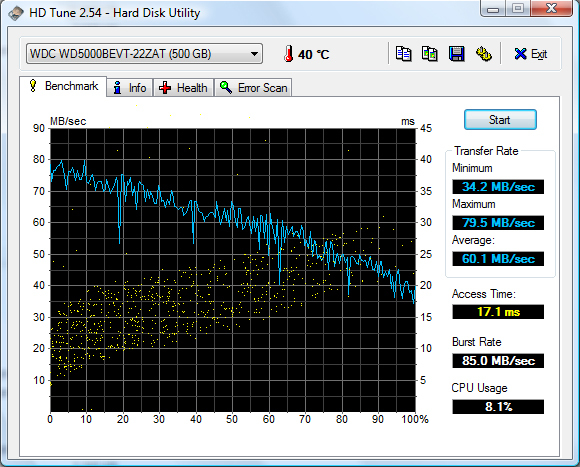 Our testsample came with a 500GB hard disk from Western Digital. In the HDTune benchmark, this drive achieved a quite respectable average transfer rate of 60.1 MB/sec with an equally good access time of 17.1 ms.
With its Nvidia Geforce 9800M GS graphics card, MSI has provided quite a solid basis for current games. 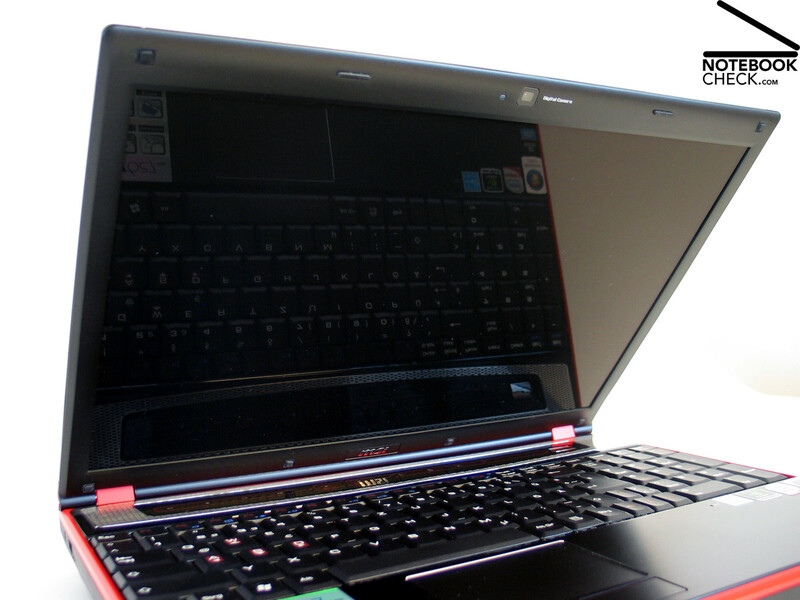 In the tests carried out, it became quite evident that the the Turbo function, with its 15% increase of CPU clock speed, had an important impact on the notebook's performance. One title in the standard repertoire of tests was the newly released yet ever extremely popular shooter Call of Duty 4. As usual, three configuration modes were tested: minimum settings (800x600, everything on low/off, 0xAA), medium settings (1024x768, everything on/medium, 0xAA) and high quality (1280x1024, everything on/high, 4xAA). On minimum settings, the benchmark test showed extremely good performance, with an average of 187.5 fps playing through the first single player mission. By activating the Turbo function, this performance can be increased even further (215.2 fps); an increase of around 15%. The results for the medium settings were obviously more restricted but still easily very playable. The performance here averaged 83.9 fps, a result that could be only increased with the Turbo option to 84.9 fps. That corresponds to a performance increase of just over 1%. Things weren't much different using the high quality settings. Here an average of 46.0 / 47.7 fps was achieved. The increase using the Turbo option here was around just 4%. In all modes tested, Call of Duty IV - Modern Warfare remained quite playable. The influence of the Turbo function however was only noticeable using lowest detail settings. It seems then that, as usual, the graphics card was the limiting factor on high detail settings. High details: can or can't? That is the most common question asked in testing of strong performing systems with the shooter Crysis. 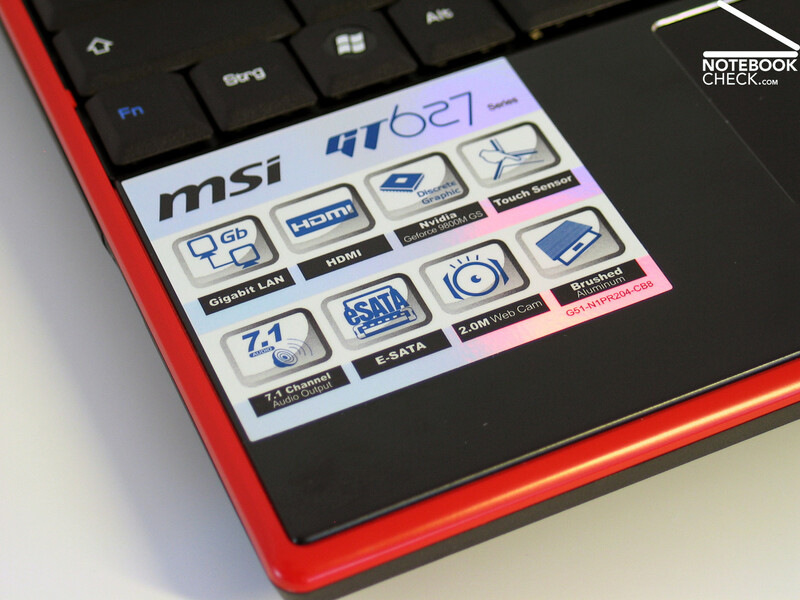 This of course also applies then for the MSI Megabook GT627. The game-integrated benchmark test confirms the results of Call of Duty IV. The influence of the overclocked CPU decreases along with corresponding increases in graphics detail. While the GPU benchmark on low details did show an increase of around 17% with the Turbo function, this increase sank to about 5% using medium settings, and on high details the effect was negligible. At a resolution of 1024x768 pixels on high detail the obtained result of 30.01 fps should technically still allow fluent gaming, however in practical gameplay things can and do get jerky at times. The increased performance demands of various visual effects can lead to temporary but visible drops in frame rate making the gameplay lag. 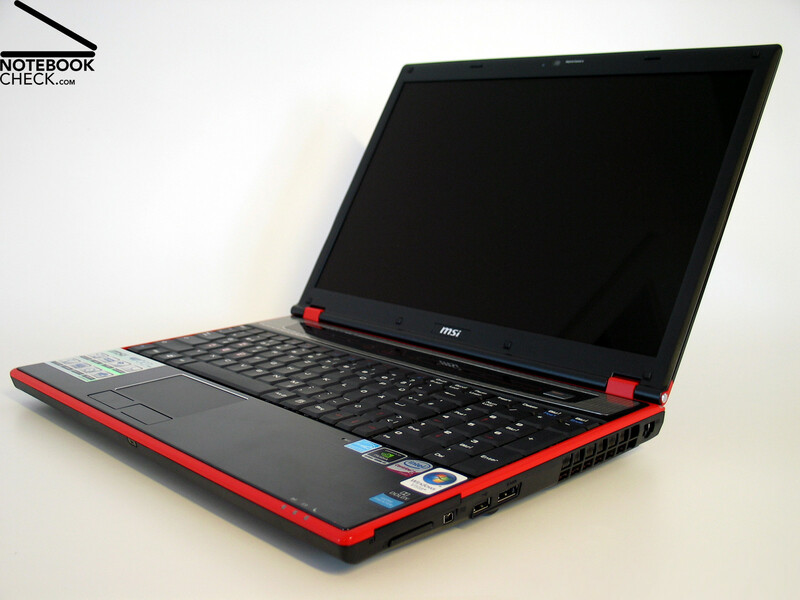 Besides Crysis, GTA IV is generally regarded as the main hurdle for gaming notebooks at the moment. While the problem in Crysis is its performance at high detail levels, GTA IV has troubles even getting started. 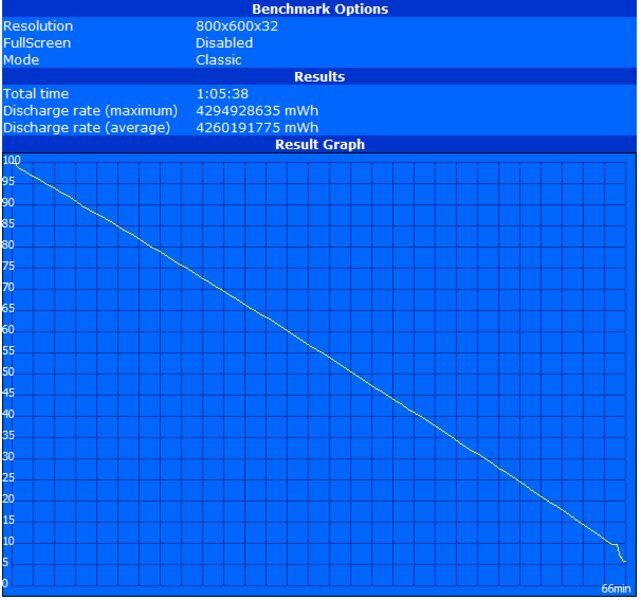 Starting with the lowest possible settings- a resolution of 800x600 pixels with all settings on minimum, the GT627 managed an average of 41.36 fps using the game's integrated benchmark test. With the help of the turbo function however this result was able to be lifted by a visible 20% to 50.03 fps. In our practical test actually playing the game, the performance achieved made for a relatively fluent gaming experience. The graphical "quality" of the game with these settings was however correspondingly low. The benchmark test on medium detail settings and a resolution of 1024x768 pixels saw the GT627 achieving an 19.44 fps, and 31.56 fps in Turbo mode. For fun and fluent gaming however this result is still just a bit too low. Playing at these settings meant constantly dealing with short pauses in gameplay. 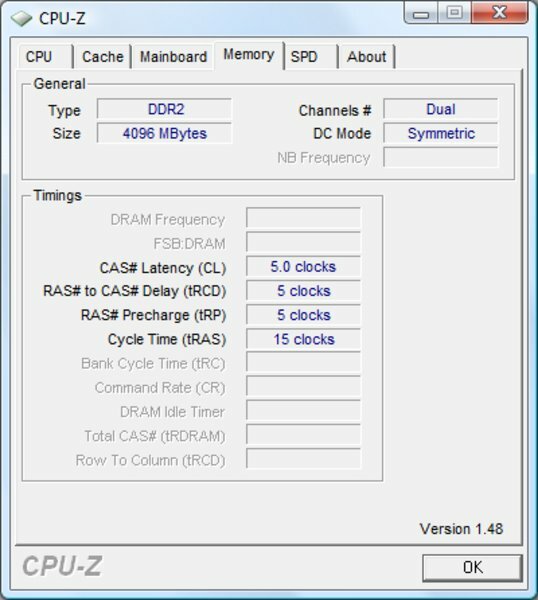 Beside World in Conflict, GTA IV turned out to be one of the few games around to which the overclocking function lends itself without exception (ie. it is pretty much necessary for fluent gameplay). For older games, it's only on lower detail settings that the CPU's performance reserves make themselves useful. Despite the notebook's respectable hardware configuration, its noise emissions in idle and office use remained within limits. The fan's movement was indeed always audible, however with a noise level of 33.5 db(A), it meant the notebook remained in the background and wasn't irritating at all. Under load, the fan speed unsurprisingly did increase, reaching a clearly louder level of 40.1 db(A), however still remained reasonable. Only the activation of the Turbo option tipped the noise to a borderline uncomfortable level of 43.7 dB(A). When gaming, this was easily manageable anyway since the concentration of the user is focused elsewhere. On the top side of the base unit, minor warm spots can indeed be detected, however they never became uncomfortable, even after several hours of gaming. That also applies for the most part to the underside of the notebook. The only hotspot to be found was in the fan area, having a maximum temperature of up to 44.3 °C. (-) The average temperature of the palmrest area of similar devices was 29.1 °C / 84.4 F (-4.6 °C / -8.3 F). The two speakers integrated on the left and right above the keyboard respectively deliver very solid yet very treble-heavy sound. A subwoofer would have been a good addition here to round out the experience. At moderate volumes the speakers are quite sufficient for undemanding sound output and music playback. At maximum volume however their weaknesses become quite apparent. 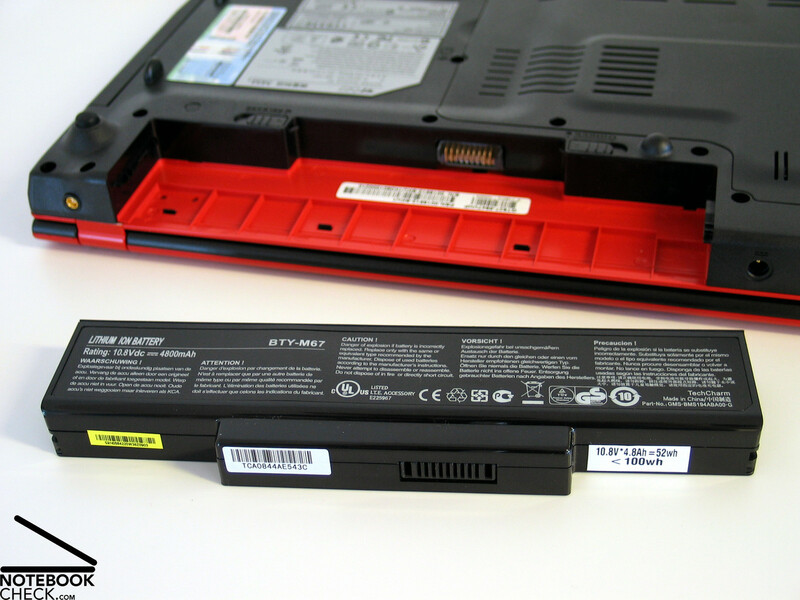 The MSI GT627 comes with a Lithium-Ion battery with a capacity of 51.84 Wh. In the maximum battery life test (Battery Eaters Readers Test, min. brightness, energie saving profile, WLAN+BT off) the notebook achieved a run time of 152 minutes. 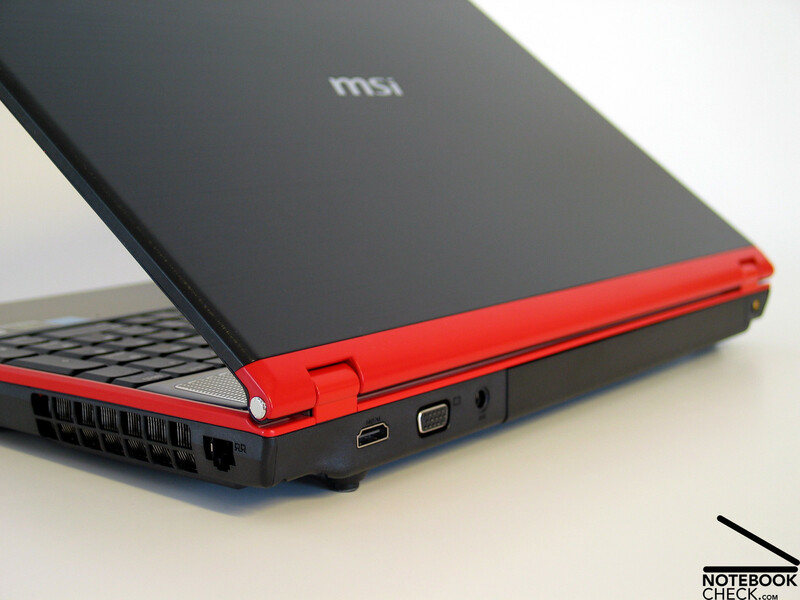 With our test model we couldn't confirm MSI's advice to use the Eco-mode to lengthen the battery life. Even with the setting on "Turbo Battery Mode", the notebook achieved the same 152 minutes. The fact that the notebook's configuration can't be expected to deliver any kind of extensive battery life under load is fairly obvious. The Battery Eater Classic Test confirms this, lasting just 66 minutes. And that's with the Turbo mode off. Practical battery life tests are also rather unimpressive. The battery life observed on our WLAN surfing test was around 130 minutes. On our DVD playback test however the notebook called it quits after just 106 minutes. The biggest drawing card for the MSI GT627 is definitely its excellent price/performance ratio. Starting new from a price of 1100 euro, you get a compact gaming notebook with an efficient Intel CPU and a powerful Geforce 9800M GS graphics card. Thanks to the overclocking function, the processor can gain a lot of ground on more powerful, yet also much more expensive chips. The GT627 only runs into problems with brand-new and extremely GPU and CPU intensive games, such as GTA IV. To be fair, it must be said that almost all current - even performance-strong - mobile systems have their fair share of the same issues. Upon close inspection, the case does indeed reveal its price-class, nevertheless MSI delivers a quite acceptable package, that for the most part remains blunder free overall. It was only the battery life that, hardly surprisingly, suffered under the load of the performance strong components included. 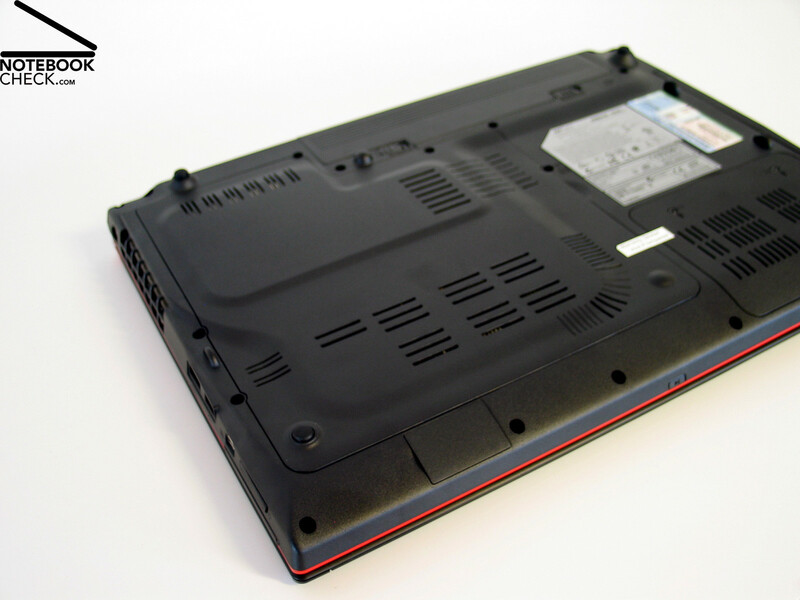 Also welcome were the results of the laptop's emission measurements; above all the restrained noise output performing office tasks, easily allowing "civil" use of the gaming notebook. The display was also impressive thanks to its generous WSXGA resolution, however showed its weaknesses in terms of its illumination and viewing angle stability. 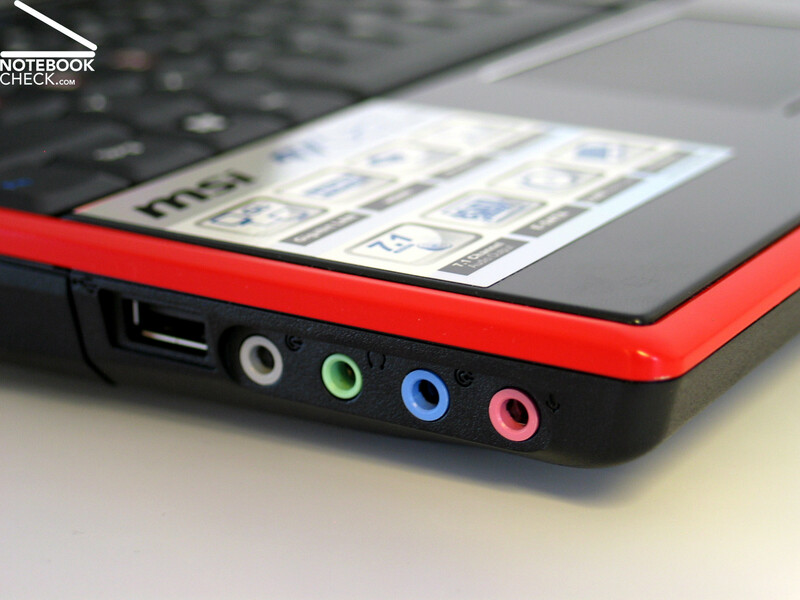 All in all the MSI Megabook GT627 is definitely to be recommended for the thrifty gamer. For its attractive price/performance ratio, certain minor cuts in quality need to be expected now and then, however for gaming use this probably takes the back seat somehow anyway. At a starting price of around 1100 euro, the MSI Megabook provides quite an acceptable hardware configuration. The panel does however have weaknesses in terms of illumination and viewing angle stability. 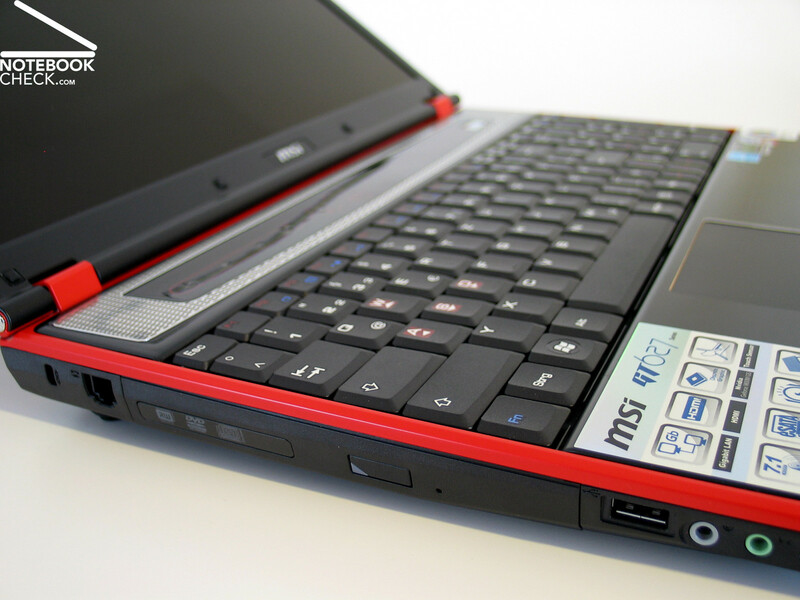 The MSI Megabook GT627 comes with a processor from Intel and a graphics card from Nvidia. 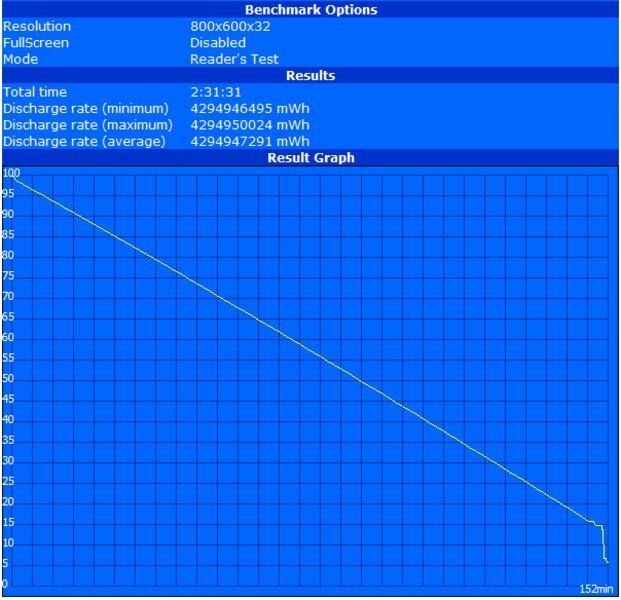 The P8600 CPU is best known for its modest power usage. Using the integrated overclocking function, MSI gets up to 2.77 GHz out of the chip. 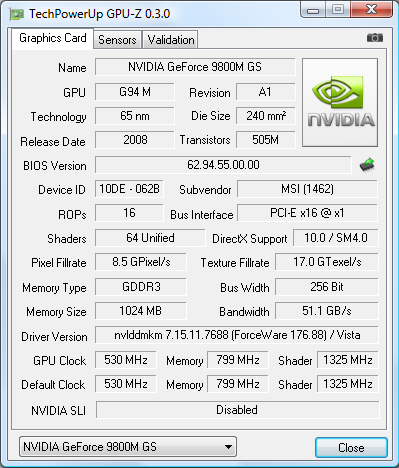 The included Geforce 9800M GS graphics card offers first class performance. 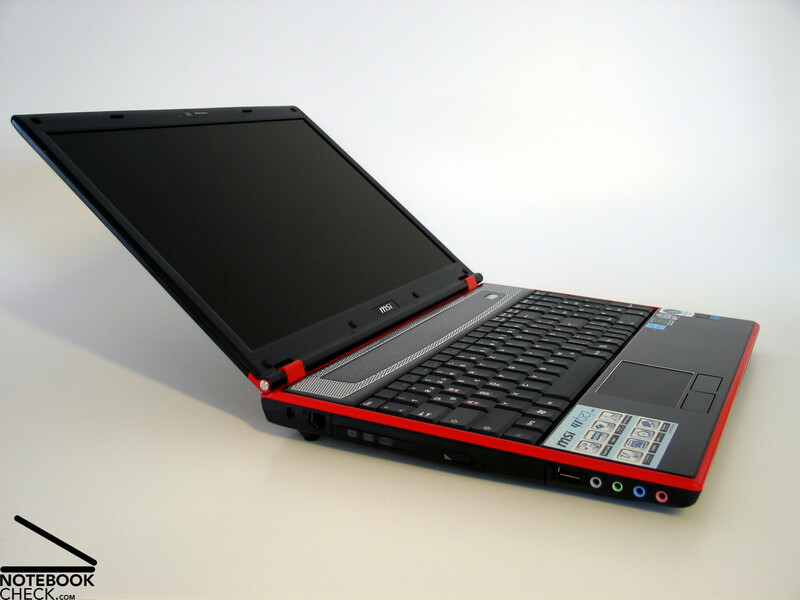 Although the notebook is supplied with a total of 4096MB of RAM, its 32-bit operating system means that only about 3GB are available for use. The user should find nothing lacking in terms of mass storage with the GT627, cared for by a 500GB hard disk from Western Digital. The fan finds itself under constant use, however its noise output during office use remains acceptable. 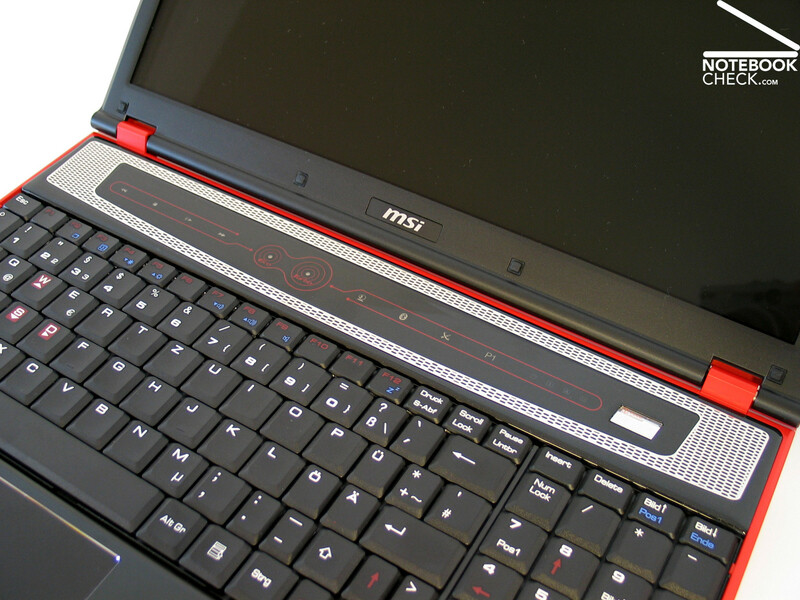 Only under load and with the Turbo function activated does the MSI GT627 become uncomfortably loud at all. Aside from one localised hotspot in the fan area, the case temperatures of the machine's underside remain in the green zone. The integrated loudspeakers are treble-heavy, lending themselves only for use during undemanding sound reproduction at moderate volumes. The display provides a great workspace overview with its extremely generous resolution of 1680x1050. Pressure sensitive additional keys also leave a good impression visually. 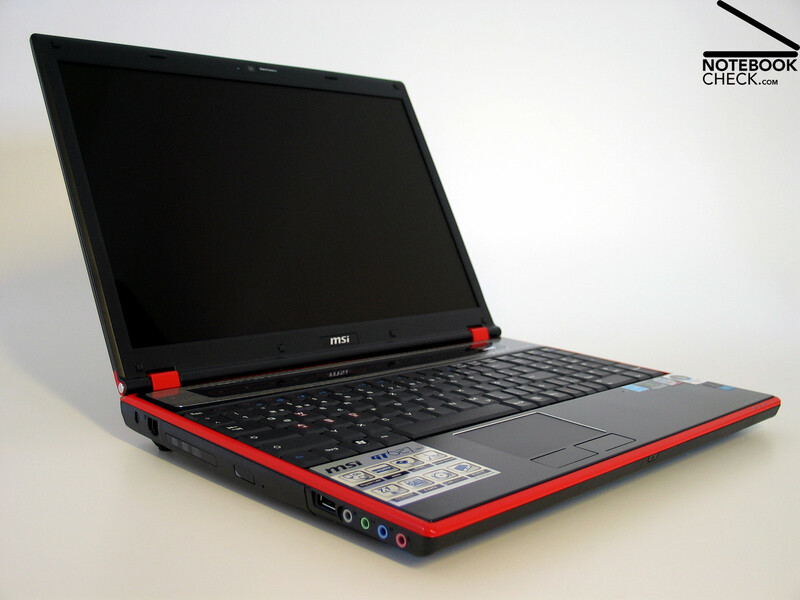 As usual on gaming notebooks, the GT627 tries its luck impressing with colourful accents. 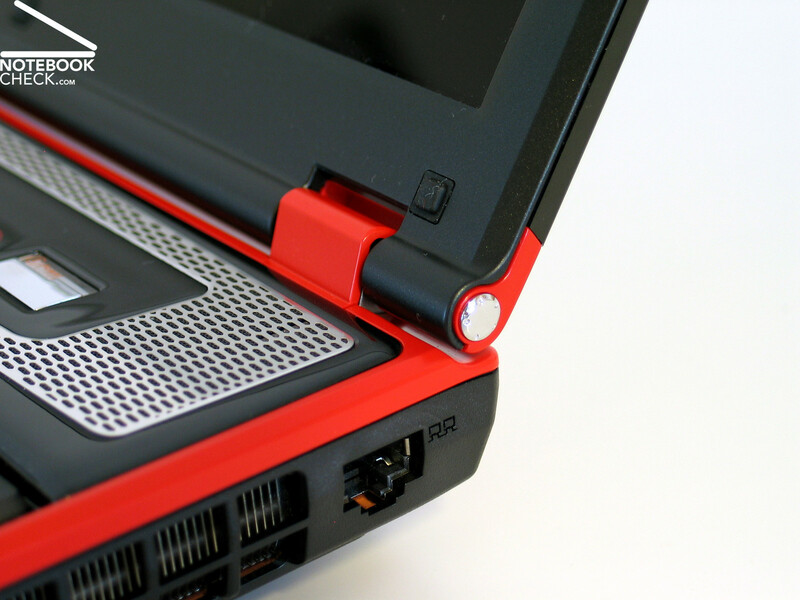 MSI solves this in the form of an appropriately discreet red strip running around the base unit, definitely facilitating a certain dynamic. 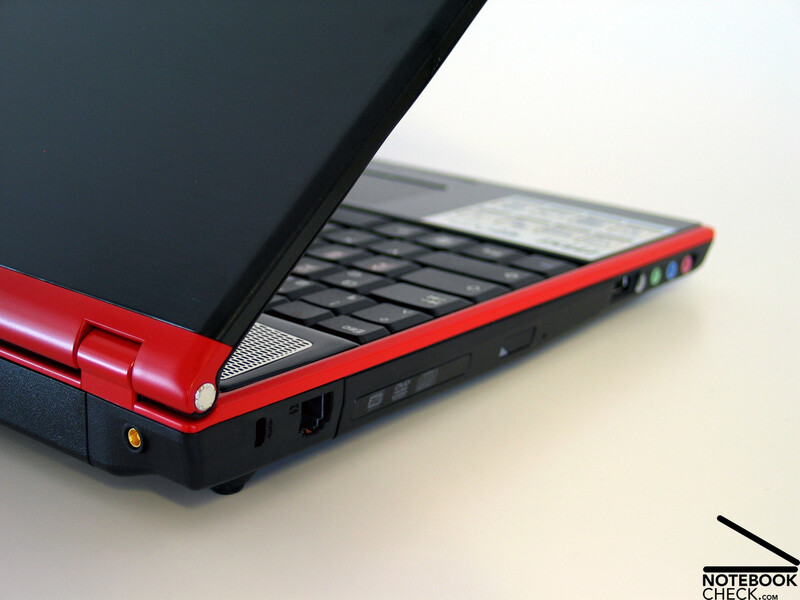 With its aluminium elements, the notebook certainly looks the part. The aluminium trimmings also work to make the display more sturdy. The base unit itself was however hardly impressive in this regard. 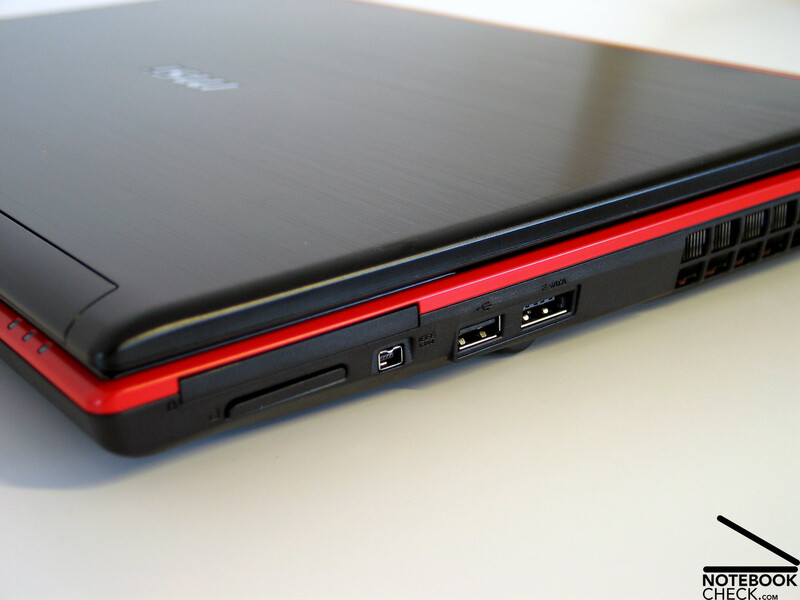 ...particularly the USB ports, which are positioned quite close to the front on both sides. 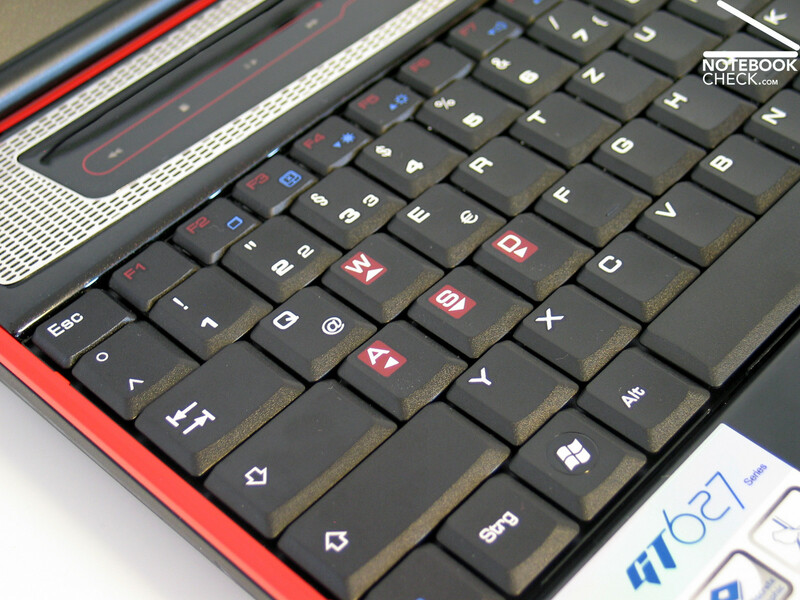 The inbuilt keyboard attempts to set a certain mood with its gamer-oriented special markings. Using it to write documents however is slightly less ideal, since the stroke depth is quite long and the keys spring somewhat when hit. One special feature of the keyboard is its additional separate number pad. 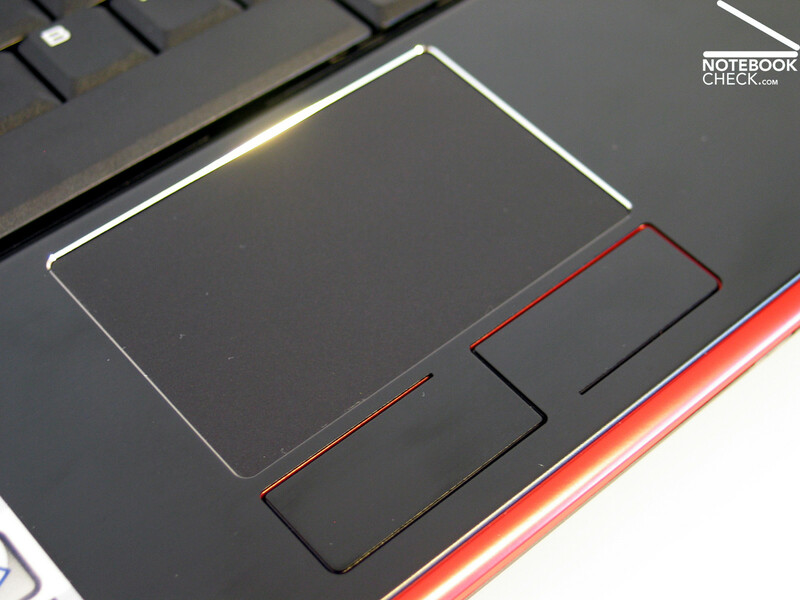 The touchpad isn't just good to look at, it's also extremely comfortable to use. With a runtime of around 2hrs the included battery isn't that impressive and restricts any serious mobile use of the notebook. 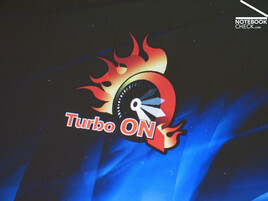 Unequivocally, the Turbo function, which unforunately still retains an extremely bad name, since on older PCs it would often provide no discernable advantage in terms of practical performance increases. A tad more performance, so that brand new gaming titles such as GTA IV are smoothly playable at reasonable graphics levels. The pricing. 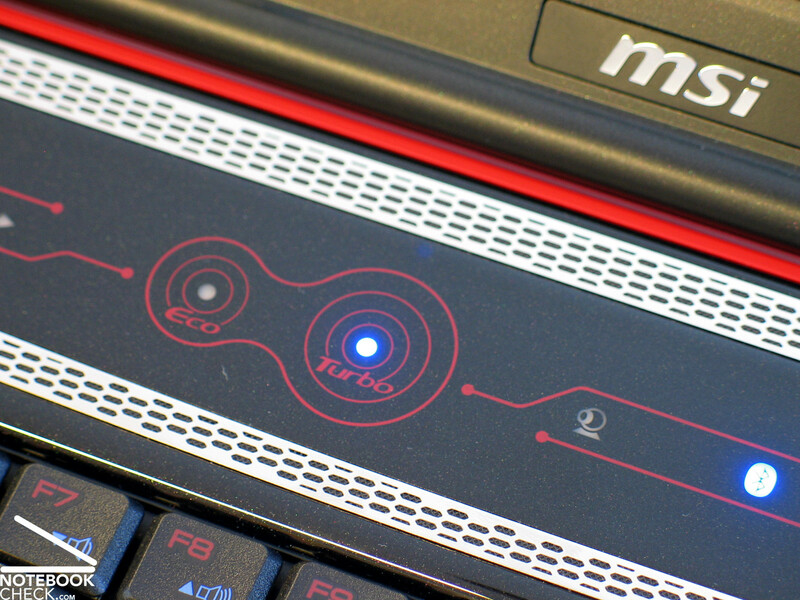 With an entry price of just over 1100 euro, the MSI GT627 offers seriously good performance. 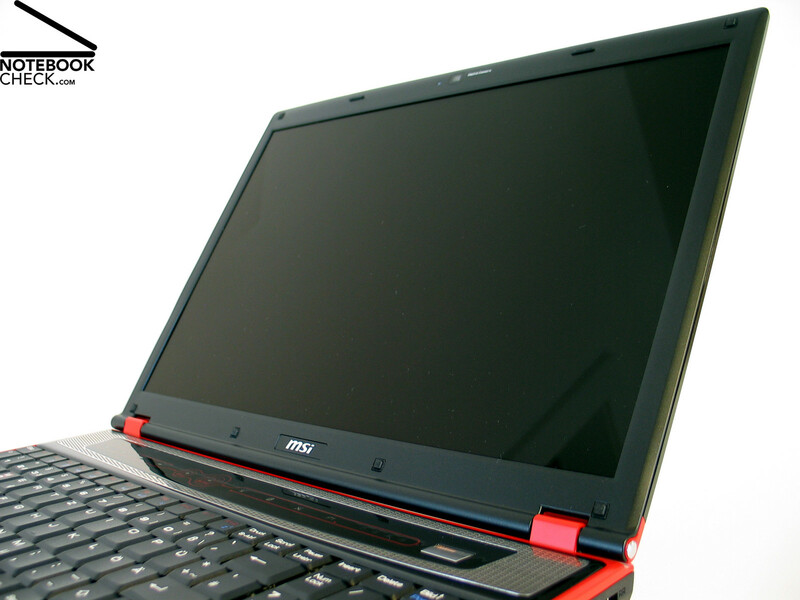 In the 15.4 inch sector, mainly the well equipped models from Acer, Asus, etc. (however most come with 9600M GT graphics)… There are also similarly high performing systems such as the Alienware m15x and the Deviltech 9000 DTX.